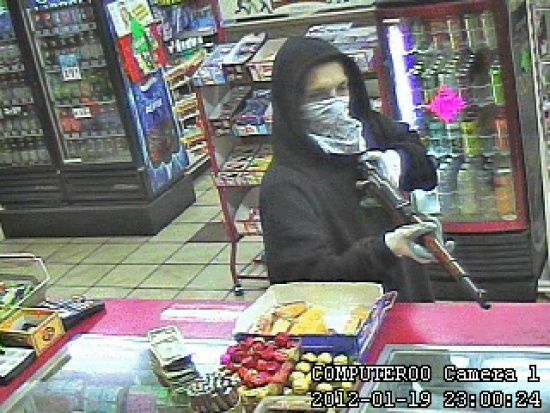 Kind of an old story, but this is pretty amazing.... someone robbed a convenience store with a Mosin Nagant. I imagine if he had fired it, it probably would have blown some windows out, set someone on fire, and deafened everyone within earshot lol /sarcasm. I find it entertaining how they still get their little dig in about it being a "high powered rifle" despite the fact that it's a shockingly stupid choice of weapon for close quarters like that and that the semi auto handgun he had could have been much more deadly given the circumstances. fttfbass;103928 Wrote: Lame. No bayonet. Considering this is I think in CA bayonets are probably banned there, which means gun control must be working....right? ....right??? *crickets* He clearly must have read the laws and planned his robbery accordingly! After looking at the photo again, I'm not seeing a buttstock on the MN. I'm pretty sure if he would have fired it while holding it like that, he probably would have incapacitated himself until law enforcement arrived. There was a story from about 10 years ago where someone tried to rob I believe it was a hotel with a Flintlock. I'm waiting for an idiot with an unloaded gun that has a giant loaded chamber indicator on it to try to rob someone who is familiar with guns and is packing heat. Try to turn a corner narrow corner in your house about as narrow as a convenience store aisle with a 4 to 4.5 foot bolt action rifle leveled at someone then try the same with a handgun....then tell me you wouldn't would rather be holding that semi-auto 1911 looking handgun instead in that situation. If I wanted to rob some place that is close quarters like that and I had the choice between mosin which will telegraph my actions from a mile away and a 1911...The mosin would stay in the car. It does look like a carbine version of the MN with the buttstock hacked off, so it's probably not much longer than your typical HD short barreled shotgun. I'd still pick the 1911 for the same reasons you mentioned above though. If he fires it, he'd better score a hit because he ain't gonna get a second chance.